We’re rather fond of Compass Box’s Last Vatted Malt, having received a bottle a few days for approval, but I’ve been waiting for something else – The Last Vatted Grain. I’m a big grain whisky fan, ever since I did a blending class with Compass Box boss John Glaser and he plonked a bottle of Port Dundas on our table, weeks after the distillery closed, and told us to taste it and work out if we thought all grain whisky was cheap filler. Suffice to say I staggered out of the room a convert and grain evangelist a short time later. 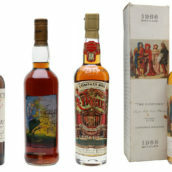 Since that day I’ve been keeping an eye out for interesting grain whiskies, of which there are sadly too few, as well as keeping a good stock of Compass Box’s own Hedonism in the cupboard. While I don’t hold such disdain for the SWA name changes as Tim does, as evinced by his blog post of yesterday, I have been keeping a close eye on the approach of the date, specifically so I could get a taste of the Last Vatted Grain, which I did last night during the final bottling ceremony. 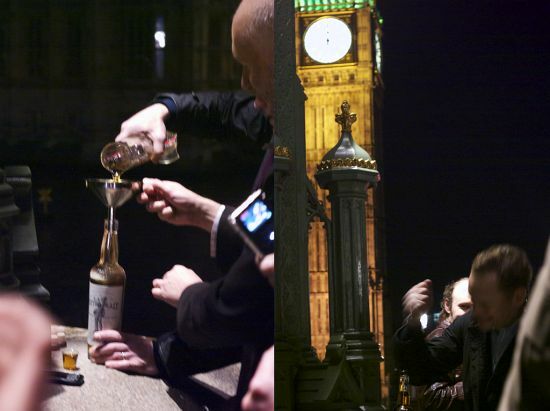 Shortly before midnight John Glaser filled the penultimate bottle of Vatted Malt, on Westminster Bridge in London with the clock face of Big Ben sitting behind us to remind us of the time. Cork thumped in John quickly set to filling the final bottle of Vatted Malt, slamming the stopper home just before the chimes started up, marking the end of the SWA regs transitionary period. Then we set to drinking properly. There was a rumour that the penultimate bottle had suffered a tragic fate, falling into the Thames, but the final bottle was securely squirreled away in John’s bag for later. Nose: Soft and buttery, with sweet porridge made with full fat milk with raisins stirred in (like I used to eat for breakfast in ye olden dayes). Butterscotch, bananas and soft cinnamon. Palate: Sweet butter and sour wood, chewy caramels, and sponge cake slathered with cream cheese icing and sat in a puddle of runny custard. Finish: Lingering Werther’s Originals fading into lightly perfumed wood. 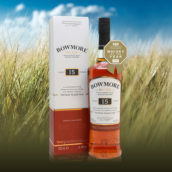 Comments: A nicely balanced whisky, riding straight down the line between cloying sweetness and too woody to give a tasty and refined dram. Nose: Classic aged grain: Pleasing toasty oak and cream soda, plus woodglue and condensed milk. Like standing in a carpenter’s workshop. Palate: Very nice. Not as dense or heavy as the LVM, but pleasantly intense nonetheless, with all the flavours from the nose. Gets a little sappy and citrussy midway through as the oak kicks in at exactly the right time to stop it becoming too sweet and flabby. Finish: Very good length considering the slightly reduced strength. Mildly drying (in a good way) with a healthy kick of spice. Comments: Extremely drinkable whisky. I’m a fan. 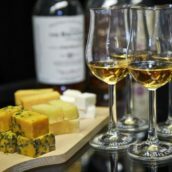 It’s a combination of 1965 vintage Invergordon, 1979 Carsebridge (closed in 1983), 1991 Port Dundas (closed in 2009) and 1997 Cameronbridge with an outturn of only 297 bottles – if you want one, get in soon. 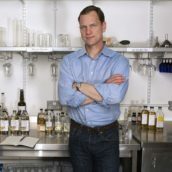 The Compass Box camp have been noticeably silent today on Twitter, recovering from yesterday’s excesses, but when they pop up be sure to congratulate them on a job well done.